This recipe comes from the Red Spice Road Cookbook and restaurant based in Melbourne. 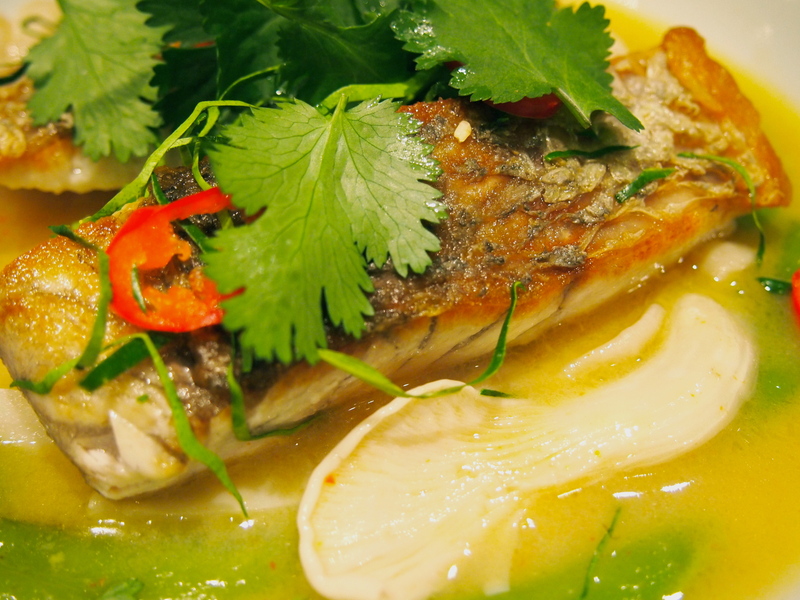 The broth has wonderful Thai flavours with just a little bit of a chilli kick. The broth and mushrooms are good enough to eat on their own but the addition of the crispy skin fish makes it an amazing meal. This is simple enough to serve for the family and yet elegant enough for company. You won’t need any accompaniments other than plenty of steamed jasmine rice to soak up the delicious sauce. 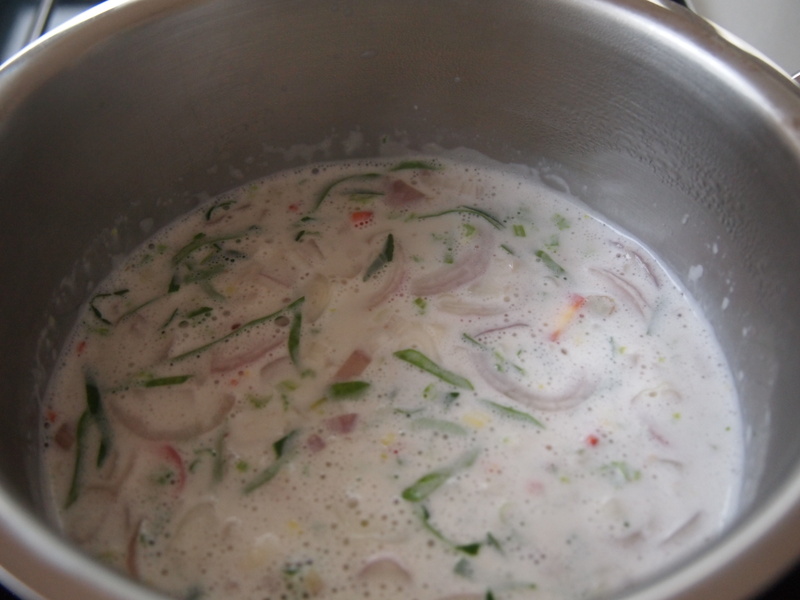 In a small saucepan bring coconut milk and stock to the boil. Add lemongrass, galangal, eschalots, , coriander root, lime leaves, chilli, fish sauce and sugar. Simmer for about 20 minutes. Taste the mixture and add more fish sauce, chilli or sugar to suit your taste. Blend the mixture using a stick blender, the strain through a sieve. Discard pulp. Add the mushrooms and simmer for a further 5 minutes or until the mushrooms are soft, then add the lime juice and set aside until required. Preheat oven to 220C. Heat the oil in a heavy based ovenproof frypan and when hot place the fish skin side down in the pan. Cook for a couple of minutes then transfer to the oven and cook until the fish is ready, approximately 5 minutes (time will vary depending on the thickness of the fish). Whilst the fish is cooking, bring the broth back up to a simmer, add the sugar snap peas and simmer for another minute. 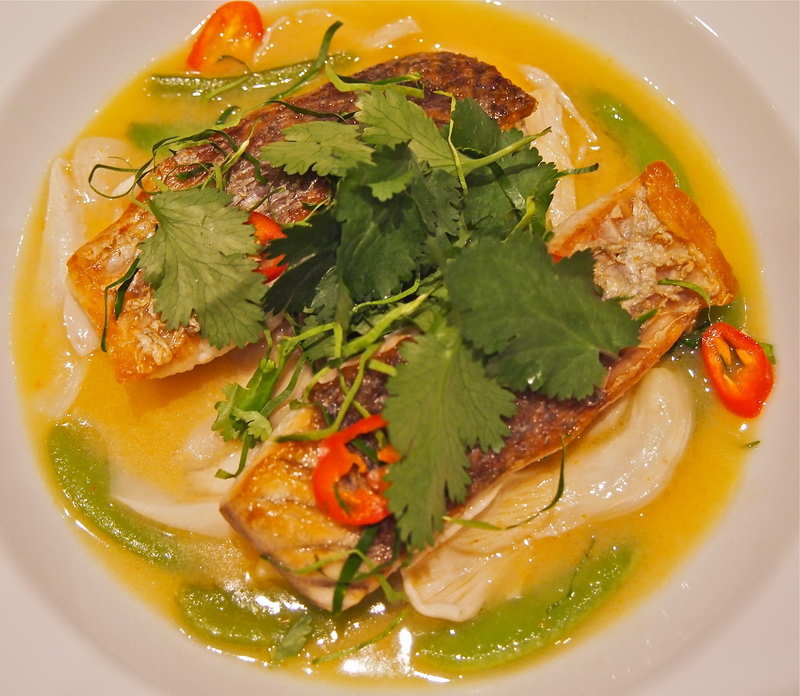 To serve, transfer the fish to a deep serving platter, ladle the broth around the fish and garnish with the coriander, lime leaves and chilli.